This enzymatic exfoliant cleanses, tones and refines your skin, leaving it fresher, younger-looking and more vibrant. 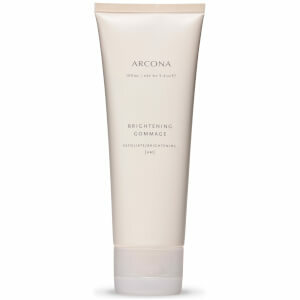 This scrub also helps to strengthen and rebuild the skin's natural barrier with a proprietary blend of fruit enzymes. Purify pores and eliminates damaging free radicals. Brightens, clarifies and soothes skin. Recommended for normal to sensitive skin types. Use 2-4 times a week: Apply 1 teaspoon to damp face, neck and décolleté in light upward and outward circles. Mix with water to desired consistency. Avoid eye area. Rinse well. i like the light, natural fragrance but don't like the ratio of cream to grains. I prefer a more dense exfoliant. I started out with the sample kit and am still using the Golden Grain Gommage from the kit although I love it so much I bought the full full size, a little goes a long way and you use in the am 3 days a week to cleanse and exfoliate, it leaves your skin so soft it is like baby skin, the granules are large but do not scratch, damage or irritate the skin. The grains dissolve a little by adding more water. I love the entire line, it is all natural, does not cause breakouts. I purchased the kit for normal skin on the advice of CSR. My skin was such a mess from using high end products with thick creamy moisturizers that were clogging my pores and causing blackheads and drying my skin, that I questioned her choice. Well my skin is now normal. ARCONA is the bomb. Their products go on a slight bit sticky but absorb very quickly and they are very lightweight and effective and fairly priced and easy to use routinely. Do yourself a favor, try it you will see the difference! Works nicely in the shower. Has a pleasant odor. It is on the coarser side. I also have the cranberry go mange, and actually prefer that one. Nice fragrance and very easy to use. The grain pieces are different sizes. Wet your finger tips and mix in the palm of your hand before you apply to the face as it is on the thick side.